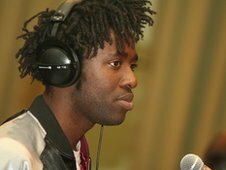 NME is reporting that Bloc Party's lead singer Kele Okereke is back with some some new solo material. 'The Hunter' EP is the follow-up to last year's album 'The Boxer' and will be released on October 31st via Wichita Records. The EP will feature 7 songs including lead track 'What Did I Do?' which sees Lucy Taylor taking over the vocals. Also in the mix is a cover of Q Lazzarus 'Goodbye Horses', for a full tracklisting please see below. Listening to 'What did I do? 'it is a totally new theme for kele, retaining none of the bloc party-es sound that ran through the boxers. How ever this isn't really a good thing as it's a song full of cheap drops, and a poor dubstep bassline- yet (maybe cos it's Kele) i'm finding it stuck in my head alot... Brave move though! I know a great Wichita locksmith service, but I don't really know anyone from Wichita records. Thanks for the video!